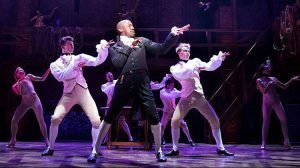 Hamilton - 5 star Review by Musical Theatre Musings. Hamilton is the biggest show to hit the West End since……. well possibly since Wicked! Tickets sold out within moments but I was lucky enough to be able to snap up 2for press night! 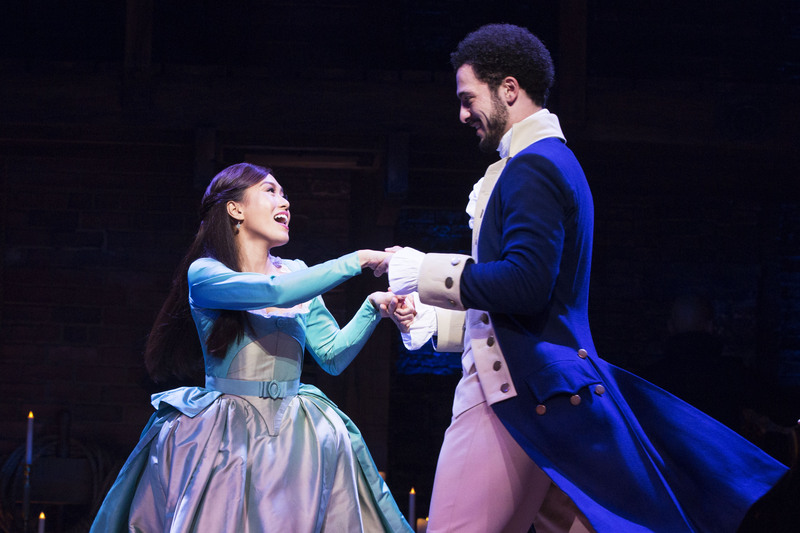 Hamilton tells the story of one of the founding fathers, Alexander Hamilton. Born in the Caribbean he made his way to America to make his mark. It goes onto to tell how young rebels and immigrants manage to ‘rise up’ and shape the future of the USA. Although the show is steeped in history the show is relevant both with Trumps Presidency and Brexit Britain, telling that the line ‘Immigrants get the job done,’ gets one of the biggest cheers of the night. The show is cast ‘colour blind’ and results in a mix of ethnicities across the roles. The show is one full of contrasts, the music is rap, hip-hop and R&B, sometimes delivered at a blistering rate other times in emotional and raw intense moments. The language used within the numbers is interchangeable from clever cusses to eloquent political phrasing, both of which sound equally natural and impactful in Lin-Manuel Miranda’s music. The chosen music genre also contrasts with the costumes, with the cast dressed in traditional dress from the period, including a lavish costume for King George. This however helps contextualise the piece. One thing that I was not expecting was the choreographic element of the show. The choreography was incredibly clever with movement being used in every moment, from the duals to the intricate rewound ‘Satisfied.’ With every pop and lock having meaning I often didn’t know where to look for fear of missing something. For such a huge opening of a brand new musical to the West End the cast are uniquely there based on talent rather than any names. Jamael Westman takes on the title role pretty much fresh out of RADA but his performance ensures that this will his first title role of many. He convincingly grows from a young, fresh faced hopeful to a father and statesman throughout the show. One of the standout performances for me came from Jason Pennycooke who was Lafayette in Act 1 and Jefferson in Act 2. Despite Pennycooke playing both parts each part had their own individual and often hilarious style. Obioma Ugoala was George Washington and this part means big boots to fill. Ugoala’s command of the stage was nearly as epic as Washington’s command of his army and his rendition of ‘One Last Time’ with Westman was a highlight of the night. Michael Jibson was King George, potentially a tricky part to play in the UK but luckily the English audience enjoyed the mocking and took it in very good humour. Jibson grew in the role and by the end his dance of glee had me really chuckling. The comedy in amongst the moments of angst added to the roller coaster of the emotional journey. There has been a huge amount of press about Hamilton with the risk that the hype is bigger than the show itself. Opening night of Hamilton however proved that the show is more than just hype – it has style, substance and staying power. Above all this, a show set in America’s history books is relevant to the UK today. If you liked this review you might also like my post on everything Hamilton including transport, pre theatre dinner and drinks, merchandise, the app, seating and more. You might also like my review for Young Frankenstein, Barnum and 42nd Street.